The stone tools that humans first held in their hands were also considered “knives”. Tools for cutting ingredients known as “kitchen knives” have advanced with the history of the human race. Good kitchen knives neatly cut without compromising the natural flavors of ingredients. 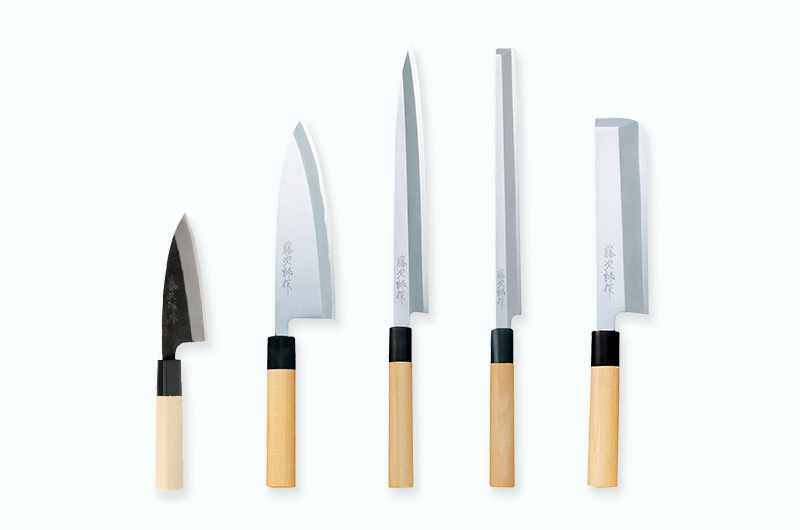 The sharpness of a blade, which cannot be expressed by numbers, have a great influence on the flavor of food. 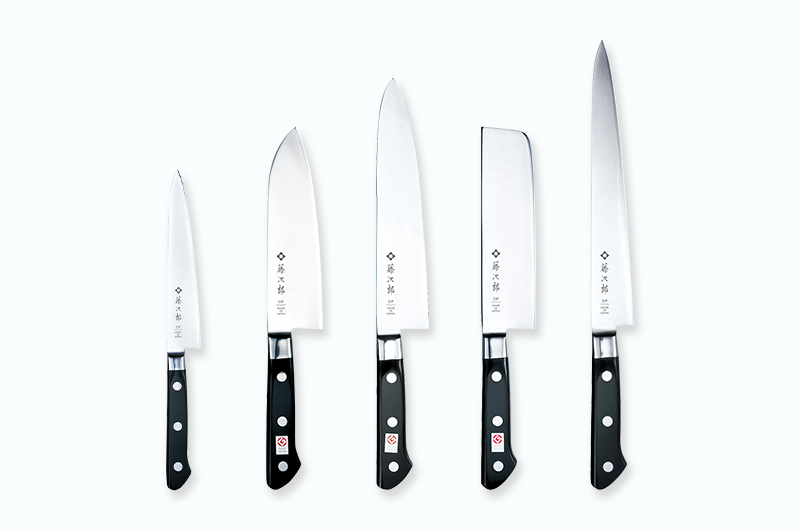 It is, of course, also important that kitchen knives are durable and easy to use, while maintaining their sharpness. We make TOJIRO knives for delicious food that will bring happiness to everyone who taste it. Remarkably hard, sharp, and durable, due to very purified cobalt contained in this stainless steel. It is hardly broken because of excellent flexibility brought by Molybdenum. Molybdenum and Vanadium contained in this stainless steel brings maximum abrasion and rust resistance. Also its long lasting sharpness makes it easy to maintain. Extra hard steel made from powdered alloy often used for metal machining. Its metal structure is very dense and thus you will get extra hardness, as well as excellent long lasting sharpness and abrasion resistance. Forged steel by multi layers Nickel Damascus which is outstanding in corrosion resistance. Because of its multi-layered structure, carbon density in the core blade increases and that brings extra hardness with steady sharpness. Ripple pattern on its surface is very unique and distinctive. By adjusting quantity of contained elements during heating process, it is designed especially for cutting tools. It is not as sharp as other steels, yet good enough for cutting tools for home use. Highly purified Shirogami steel with chromium and tungsten added. Extra hard, excellent sharpness and abrasion resistance. Though it requires certain sharpening technique, long lasting sharpness can be obtained once you get used it. 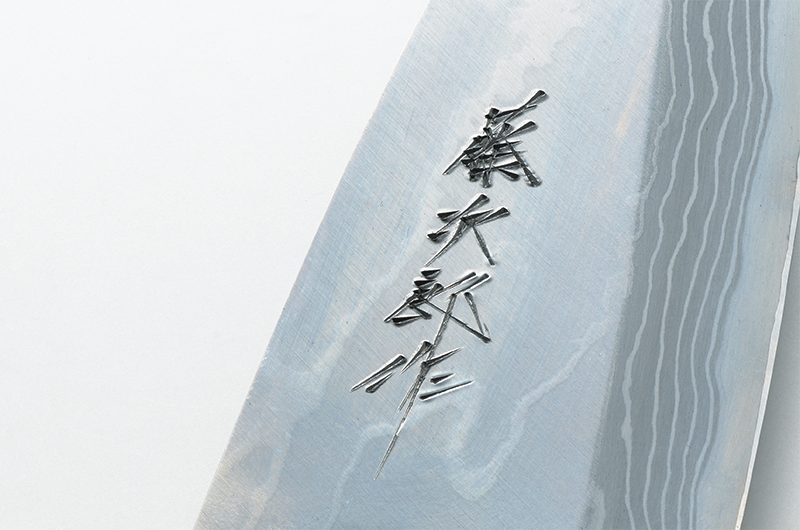 Compare with Aogami steel, it has less abrasion resistance but friendly on sharpening and keeps long lasting edge. Iron sand as raw material, it is very purified steel, and temperature control during its heat processing requires skill. This is a small type of Chef knife and its suitable for peeling, decorative cuts and fine designs. This small versatile knife is often used as substitute of the Santoku if the length of the blade is slightly longer. This knife can be versatilely used for meat, fish and vegetables, and its suitable for daily use in the kitchen. Santoku knives combine the good points of both the Chef knife and Nakiri. Also known as a “Gyuto” in Japan, the shape of this knife was brought from overseas into Japan in the mid 18C together with eating habit of beef. 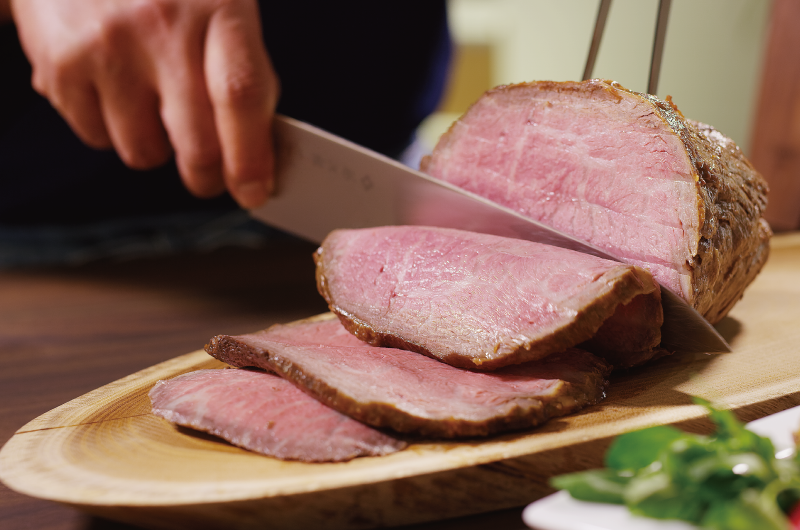 Although primarily used to cut meat, it can also be used for cutting fish and vegetables. This knife is meant for cutting vegetables. It is suitable for peeling and thinly slicing because the edge is straight. The blade is finished to be thinner compared to Santoku and Chef knife. This knife is used to cut relatively large slabs of meat into parts. It is also used as a slicer or Sashimi knife because of its narrow and long blade. This knife is used to filet small fish such as horse mackerel and thin fleshed fish. It is also convenient for gutting fish because the blade is thinner than that of the Mini Deba (Kodeba). Meant for trimming fish, this knife has a very thick blade and it used for fileting fish into 3 pieces and slicing fish open to debone and remove the head. There are different types of Deba depending on the application such as cutting large salmon and fileting narrow fleshed fish. This knife is meant for slicing sashimi and is used by carving off slices of the boneless upper flesh of fish from the base of the blade to the tip. There are different types of Yanagi-Sashimi depending on the application such as shell crackers for cutting open shellfish and thin blades for cutting pufferfish. This is a Kanto-style sashimi knife that is rectangular in shape and is shorter than the Yanagi-Sashimi. It is used in the same manner as the Yanagi-Sashimi. This knife is meant for cutting vegetables. Although it resembles the Nakiri, the Usuba is single bevel. It is best suited for peeling vegetables, especially daikon radish.